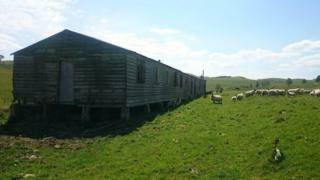 One of Scotland's biggest archaeology projects has been launched at Stobs Camp near Hawick. It hopes to unearth the detailed history of what has been described as the "best preserved" World War One internment camp in the world. It was home to up to 4,500 German prisoners of war during the conflict. Dr Chris Bowles, Scottish Borders Council's archaeologist, said the project was important as without it the story of the camp could be lost. The site was acquired by the UK government from the owners of the Stobs Castle Estate in 1902 and the following year it was established as the main training base for British soldiers in Scotland, hosting 20,000 soldiers in its first full year. However, usage tailed off during the following decade and its future was in doubt until the outbreak of war in 1914 when it started a new role. Dr Bowles started a project proposal for the area several years ago, having identified the potential of the site. "This really is a huge project, and will be one of the biggest archaeology projects in Scotland," he said. "Stobs Camp is of international significance because of the excellent state of preservation of some of its infrastructure - it is the best preserved First World War internment camp in the world and was the headquarters of the POW camp system in Scotland. "This project is important as without it there is a real danger that the story of Stobs will be lost and the buildings that remain deteriorate further." He said the aim was to develop a management plan for the site, improve access for visitors and create interpretation materials, including an app, to make sure the important role of the site was remembered. Dr Bowles said: "Stobs was used to house POWs for over five years, stretching on until after the war was officially over, and during that time around 45 POWs died in the camp from various ailments, despite there being a hospital on site. "The camp commandant allowed the prisoners to create a cemetery, which still exists, although in the early 1960s the bodies were all exhumed and reburied in a German war graves cemetery in Staffordshire." Prisoners built a cairn to remember their comrades at Stobs and also planted a ring of yew trees behind the memorial. However, the memorial was destroyed and the Stobs camp was decommissioned by the army in the 1960s. As part of the new project, the Borders Family History Society is tracing the ancestors of the German soldiers and seamen interred at Stobs. It also aims to restore the cairn and host a special ceremony on Armistice Day 2018, on the 100th anniversary of the end of World War One. Andrew Jepson from Archaeology Scotland, the Stobs Camp project officer, said: "Stobs Camp has a fascinating story to tell, and so far we have only just scratched the surface. "We are now very much at the start of what will be an exciting journey of discovery. "Along with our team of volunteers we will now be able to conduct a detailed survey of the POW camp, record the camp buildings and undertake targeted excavation." The project has been supported by SBC, Historic Environment Scotland, the Hawick Archaeological Society, Borders Family History Society, Live Borders and other local partners. Funding has come from the Heritage Lottery Fund (Scotland), Borders LEADER, Historic Environment Scotland, Fallago Environment Fund and BCCF Environmental.